Introducing the various CQL statements via a practical example. Cassandra Query Language or CQL is a data management language akin to SQL. CQL is a simple API over Cassandra’s internal storage structures. Apache Cassandra introduced CQL in version 0.8. Thrift an RPC-based API was the preferred data management language prior to the introduction of CQL. CQL provides a flatter learning curve in comparison to Thrift and thus its is the preferred way of interacting with Apache Cassandra. In fact, Thrift support is slated to be removed in Apache Cassandra 4.0 release. Let’s start off by understanding some basic concepts i.e. cluster, keyspaces, tables aka column family and primary key. Apache Cassandra Cluster – A cluster is a group of computers working together that are viewed as a single system. A distributed database is a database system that is spread across a cluster. Apache Cassandra is a distributed database spread across a cluster of nodes. 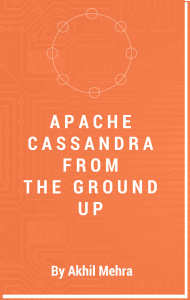 Think of Apache Cassandra Cluster as a database server spread across a number of machines. Keyspaces – A keyspace is similar to an RDBMS schema/database. A keyspace is a logical grouping of Apache Cassandra tables. Like a database, a keyspace has attributes that define system-wide behaviour. Two key attributes are the replication factor and the replication strategy. The replication factor defines the number of replicas the replication strategy defines the algorithm used to determine the placement of the replicas. Tables – An Apache Cassandra table is similar to an RDBMS table. Like in an RDBMS a table is made up of a number of rows. This is where the similarity ends. Think of an Apache Cassandra table as a map of sorted maps. A table contains rows each of which is accessible by the partition key. The row contains column data which are ordered by the clustering key. Visualise an Apache Cassandra table as a map of sorted maps spread across a cluster of nodes. Primary Key – A Primary key uniquely identifies an Apache Cassandra row. A primary key can be a simple key or a composite key. A composite key is made up of two parts, a partition key and a cluster key. The partition key determines data distribution in the cluster while the cluster key determines sort order within a partition. The diagram below helps visualise the above concepts. Notice how keyspaces and tables are spread across the cluster. In summary, Apache Cassandra cluster contains keyspaces. Keyspaces contain tables. Tables contain rows which are retrieved via their primary key. The goal is to distribute this data across a cluster of nodes. To go through this tutorial you need Apache Cassandra installed. You can either use a Docker base Apache Cassandra installation or use any of the installation methods laid out in 5 ways to install Apache Cassandra. I will be using the Docker base Cassandra installation. Cqlsh is a Python based utility that enables you to execute CQL. A cqlsh prompt can be obtained by simply executing the cqlsh utility. In the Docker-based installation navigate to the containers command prompt. Once at the command prompt simply type cqlsh. For native installs the cqlsh utility can be found in CASSANDRA_INSTALLTATION_DIR/bin. Executing the cqlsh utility will take you to the cqlsh prompt. The first things you need to get familiar with is navigating around a cluster. The DESCRIBE command, or DESC or shorthand, is the key to navigating around the cluster. The DESCRIBE command can be used to list cluster objects such as keyspaces, tables, types, functions, aggregates. It can also be used to output CQL commands to recreate a keyspace, table, index, materialized view, schema, function, aggregate or any CQL object. To get a full list of DESCRIBE command options please type HELP DESC at the cqlsh prompt. The HELP provided is self-explanatory. command provides a list of all keyspace. Go ahead and execute this command. 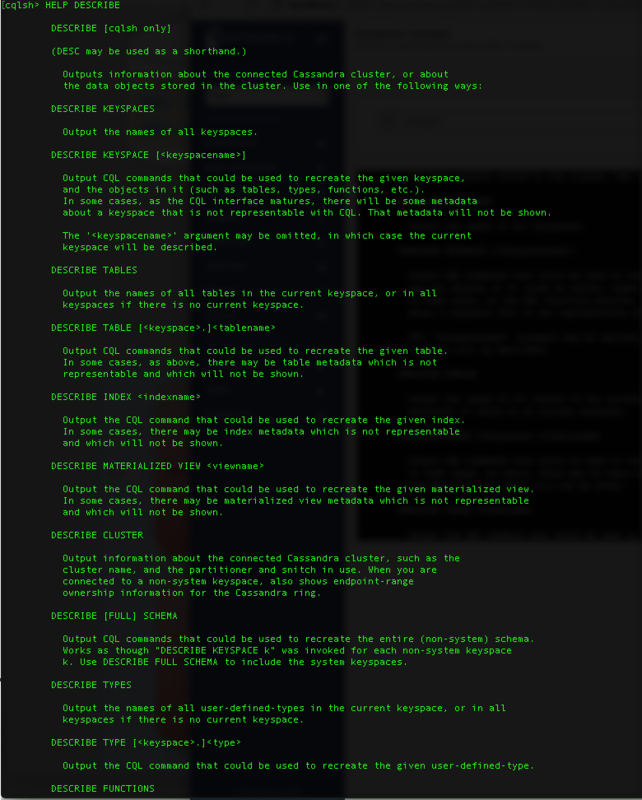 Since we have freshly installed Apache Cassandra all you will see a list of system keyspaces. Systems keyspaces help Apache Cassandra to keep track of cluster and node related metadata. Let’s create our first keyspace. The keyspace is called animals. Execute the statement below to create the animal keyspace. Two key parameters to take note of is the class and the replication factor. The class defines the replication strategy i.e. algorithm used to determine the placement of the replicas. The replication factor determines the number of replicas. Since I have three node cluster I have chosen a replication factor of 3. Let’s create a table called monkeys in the animals keyspace. Execute the following command to create the monkey table. Take special note of the primary key. The primary key defined above is a composite key. The primary key has two parts. i.e. partition key and cluster key. The first column of the primary key is your partition key. The remaining columns are used to determine the cluster key. A composite partition key, a partition key made up of multiple columns, is defined by using an extra set of parentheses before the clustering columns. The partition key helps distribute data across the cluster while the cluster key determines the order of the data stored within a row. Thus type and family is our composite partition key and common_name is our cluster key. When designing a table think of the partition key as a tool to spread data evenly across a cluster while the cluster key helps determine the order of that data within a partition. Your data and query patterns will influence your primary key. Please note the cluster key is optional. Let’s insert some data into above table. When inserting data the primary key is mandatory. Execute a select statement to see that the data has been inserted successfully. Note columns in red are your partition key. Cyan coloured columns are your cluster key. The columns in purple are the rest of your columns. Cassandra enables users to configure the number of replicas in a cluster that must acknowledge a read or write operation before considering the operation successful. The consistency level is a required parameter in any read and write operation and determines the exact number of nodes that must successfully complete the operation before considering the operation successful. This implies that only one node needs to insert data successfully for the statement to be considered successful. The statement is executed on all replicas but only needs to be successfully written to one in order to be successful. On each node, the insert statement is first written to the commit log and then into a memtable i.e. a write back cache. The memtable is flushed to disk either periodically or when a certain size threshold is reached. The process of flushing converts a memtable into an SSTable. Let’s manually flush the above insert to disk so that we can examine the created SSTable. You can force a flush by executing the following at the command prompt. Note the partition object contains the partition keys used while the rows array contains the row data for the partition. 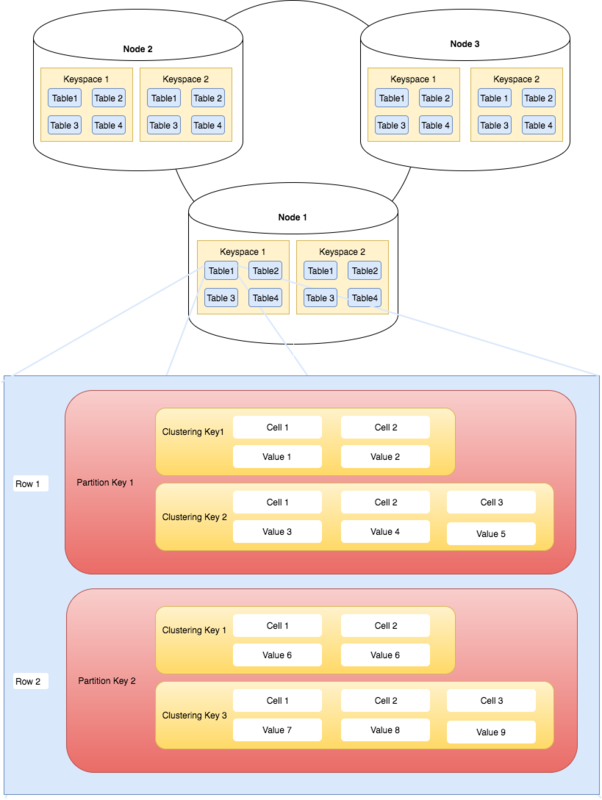 The rows object contains a clustering array that stores our cluster column related data. The cells array in the row object contains all additional column data. Let’s insert some additional data to see how this affects the underlying storage. The first thing you should notice is a new file mc-2-big-Data.db. Note mc-1-big-Data.db has not been updated to as SSTables are immutable. Please run the following command to output JSON output for mc-2-big-Data.db. Note we now have data in two partition keys. Observe that in the second partition row data is sorted by the cluster key. Notice that the second insert did not error out even thought that data already existed. This is because inserts in Cassandra are actually upserts. An upsert inserts the row if it does not exist otherwise updates the existing data. In your data directory, you should see a new file mc-3-big-Data.db. Please run the following command to convert mc-3-big-Data.db into JSON. The first thing to notice is that deletion does not result in any actual data being physically deleted. This is because SSTables are immutable and are never modified. In fact, the delete statement caused an insertion of a special value called a tombstone. A tombstone records deletion related information. There are many kinds of tombstones. The delete statement above caused the insertion of a row tombstone. Like inserts updates in Cassandra are an upsert. The following is an example of an update statement. Even though the primary key specified in the update statement does not exist data will still be inserted. This is due to the upsert semantics of a CQL update statement. In the case, the primary key already exists the appropriate values will be updated. Feel free to flush the animal keyspace and view the data file created. Using the TTL function you can query the number of seconds left for the column to expire. Please note a TTL is only assigned to non-primary key columns. Use the nodetool flush command to check data saved to disk. You should see something similar to the following JSON. Look at the liveness_info object. It has an addition of ttl and expires_at element as opposed to previous data file outputs in this tutorial. The expires_at specific the exact UTC time when the columns will expire. The ttl element specifies the TTL value passed in on insert. When a TTL is present on all colums of a row then on the expiration of the TTL the entire row is omitted from select statement results. When the TTL is only present on particular columns then only that particular columns data is omitted from the results. CQL supports an array of data types which includes character, numeric, collections, and user-defined types. The following table outlines the supported data types. duration Defines a time interval. Duration can be specified in three different formats. Distributed Counter counter 64-bit signed integer that can only be incremented or decrimented. Let’s create a table which has all the above data types and insert some data into the table. Feel free to flush the table to disk and observe the JSON data. This is a cqlsh bug in Cassandra 3.10. Please refer to CASSANDRA-13549 for further details. A counter is a 64-bit signed integer whose value can only be incremented or decremented via an UPDATE statement. A counter column cannot be part of a primary key. A table that contains a counter can only contain counter columns. Columns with any other data type are not permitted. You cannot use a TTL with a counter column. Counter are not idempotent. This is especially tricky when handling erroneous situations.